Along with our charity work within the local communities of Knutsford and Wilmslow, our patients have helped recycle a vast amount of specs over the 26 years we have been here! 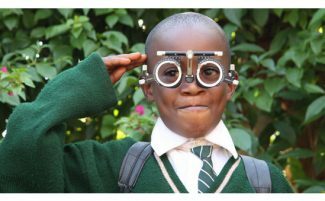 Every patient is actively encouraged to recycle old specs to help fundraise for Vision Aid Overseas, an amazing charity that helps gives the gift of sight worldwide. Vision Aid Overseas is an international charity dedicated to fighting poverty by transforming access to eye care in developing countries. 640 million people – 10% of the world’s population – are disadvantaged by poor vision and a lack of spectacles. Contrary to popular belied, recycled spectacles are not sent overseas. Vision Aid Overseas will ensure spectacles are recycled in an environmentally-friendly way and income generated from recycling is used to support our programmes overseas. At Clare & Illingworth we always advise that you have a spare for yourself in case of emergencies but if you have any others spare, please pop them in to either practice and we will send them off to be recycled for you. This entry was posted on Friday, August 5th, 2016 at 2:25 am and is filed under All. You can follow any responses to this entry through the RSS 2.0 feed. You can leave a response, or trackback from your own site.